Singhare ka halwa is made from the flour of the seed of Indian water Chestnut or singhare, an aquatic vegetable that grows on pond and lake. Singhare is rich in minerals like iodine, manganese, potassium. So the intake of this fruit in ample amount makes your thyroid health fit and the level of mineral salts become stable.Chesnut is full source of energy.Singhare ke atte ka halwa or sheera is usually made during Navratri festival or vrat or another fasting days like Ekadasi, Mahashivratri or Krishna Janmashtami.Singhare ke aate ka halwa is very easy and quick to make. Take a heavy bottomed pan or kadhai heat the ghee on medium flame add cardamom powder, flour, and roast on low flame until flour turn light brown color. It will take 5-7 minutes, keep stirring the mix continuously, after that add the water and sugar, stir well to avoid forming lumps. Add all dry fruits, half dry grated coconut mix it and cook 1-2 minutes. 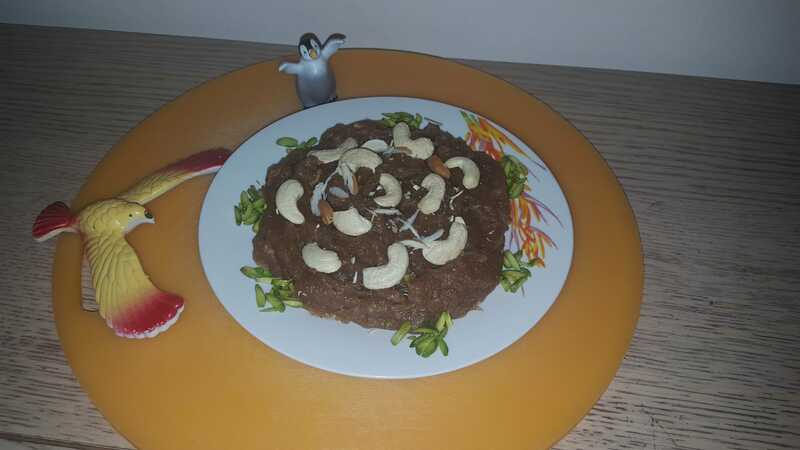 Halwa is ready, sprinkle kept aside another half-dry coconut on it.